It’s no secret that I love urban fantasy more than any other genre out there, and I love it even more when urban fantasy flirts with horror just a little bit. 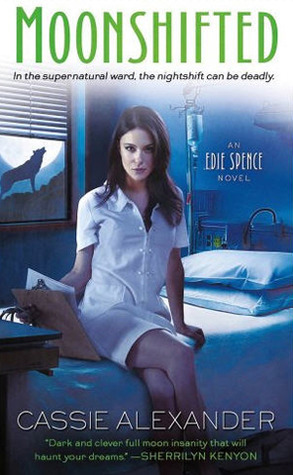 I discovered the Edie Spence series entirely by accident, really enjoyed the first book, Nightshifted, and now I’m happy to report that the second book didn’t diminish my love for it in the least. I think what people like most about Edie is that she’s just a regular woman, very non-heroic and plain. She works her night shifts at the hospital, gets conned over and over by her addict brother and pushed around by the supernatural community. She has no lasting relationship, no real friends, and her bond with her family is tenuous at best. One can’t help but feel compassion for Edie and her sad, quiet life, but there are times when she seems just a bit too passive. I like reading about regular people in unusual circumstances, and I don’t necessarily want them to be fearless or heroic, but resourceful would be nice. Edie is often just a pushover, for her brother, her co-workers, the mysterious Shadows and the entire supernatural community, especially the vampires. She gets involved in their business in very odd ways, they get her to do their dirty work with just two words of flattery and then keep her in the dark and fail to protect her from things they brought to her doorstep. I pulled on my scrubs and all the silver that I currently owned. Between my belt, bracelet, and badge – which might warn me a second or two before any attack –I’d give myself even odds on surviving for five seconds once I was outside my door. Five whole seconds, although not necessarily painless ones. In Nightshifted, Edie took it upon herself to save a vampire child, and now that vampire child, Anna, asks her to be some kind of Ambassador, involves her in things Edie doesn’t even begin to understand, and then just disappears without protecting her in any way. There were times when I wanted to yell at Edie to grow a spine, but there would be no point. She is who she is. "You can't just leave anyone. It's one of your biggest virtues, and one of your worst flaws." Edie is constantly surrounded by grotesque creatures she relentlessly takes care of, even when it’s not her job to do so. As I said in my opening paragraph, I love it when urban fantasy flirts with horror, and Cassie Alexander balances the fine line between the two wonderfully. Sure, some of the descriptions might turn your stomach (they did mine, and I’m not exactly a delicate flower), but this is what sets the series apart and I really like it. At this point, I’d hate for Edie to find a steady relationship and then get her act together and become less pathetic (harsh words, Maja, harsh!). I don’t want a man to fix her life, that would be even more pathetic. I want her to find her own footing, start taking care of herself and then maybe get into a serious relationship, preferably with Asher. I like Asher for her, and I have a feeling he wouldn’t just abandon her like Ty (although he did give me reason to think otherwise). He’s charming and attractive and, you know, definitely NOT a zombie. I’ll keep my fingers crossed. What I really wanted, but didn’t get from Moonshifted was a stronger story. The first half was essentially plotless, or at the very least directionless. So many things were happening at once, and at the same time, nothing was happening at all. I still couldn’t clearly outline the plot for you, nor do I wish to try. For the first 80%, Moonshifted suffered from the worst case of Second Book Syndrome I’ve ever seen, but at least it ended with a bang. Hopefully, the next book, Shapeshifted, will be a bit more exciting in that regard. Oh well, can't win them all, I say. I haven't really read this series yet but I've seen some good reviews. On to the next one, eh? I've heard this series is pretty good :) Nice review! I do want to read more though! Fab review, Maja! We do have a difference of opinion here because I felt this was a stronger more coherent book than the first one, and Edie compassion and inability to believe she is worth more than she is getting I could perfectly understand. You see she really fits the profile of many people like that with junkie relatives. I've definitely seen a reflection of her in people I know and for them it takes a lot of work to change that psychology. When you are conditioned to give, give, give and made to feel guilty all the time (her brother's doing) it takes awhile to disentangle from this web. I think she is bound to change at some point. I hope it will happen. Love your review Maja, so sorry the plot wasn't stronger, the premise sounds so good. I feel kind of sorry for the MC. It's funny to see the difference of point of view, I thought this one was a little better than the first one. But I hope the sequel will be better for you now. I was really surprised by then end, I can't wait for more. Oh, I always feel so terrible for some of those sophomore novels, when they just aren't cohesive or live up to the first one. And I completely agree about the character finding her own footing. Falling in love is not a cure-all for what's wrong with the character, though it can be part of the solution. And urban fantasy is definitely one of my very favorite genres, too! I really like the sound of this, Maja, and I'm pretty sure I've seen the cover on your blog before. I wouldn't want the MC to end up needing a guy to fix her life, so I hope that doesn't happen!